Marion Montgomery, Cleo Laine, Lita Roza, Maynard Ferguson and the Ronnie Scott Orchestra. Cleo Laine and John Williams. "Imagine". from "Cleo and Friends" 1980's. 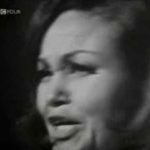 Cleo Laine - Being Alive - 1st High note record breaker before Mariah & Minnie !